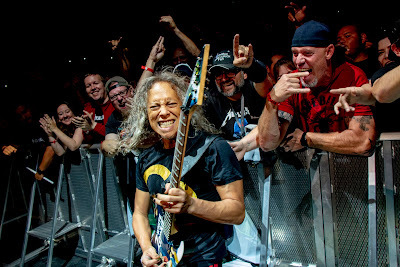 Metallica performed the “Hardwired…To Self-Destruct” track, “Dream No More”, at the Alerus Center in Grand Forks, ND on September 8, and the band are streaming professional footage from the event. The 2016 record debuted at No. 1 on the US Billboard 200 to deliver the group their sixth US chart-topper. The set was named Top Rock Album at the 2017 Billboard Music Awards, and was shut out at the 2018 Grammy Awards, where it had two nominations: for Best Rock Song (“Atlas, Rise!”) and Best Rock Album; the latest recognition marked Metallica’s 22nd and 23rd Grammy nominations, while the band have won nine times since 1989. During their current fall tour of North America, Metallica will release multiple 30th anniversary editions of their 1988 album, “…And Justice For All”, on November 2.